Me, I generally like to do sporadic research about random aspects of something. Then, I stress out about the stuff I didn’t research and agonize about the fact that I should be researching other things I don’t know about. Then, when the actual event I’m planning for, when that arrives, I think quickly on my feet and things work out pretty good. In terms of planning strategies, this isn’t one you’ll discover in any books. That’s because it’s a bad strategy. Some people think I remain calm and go with the flow. They’re generally undervaluing just how much I overthink things while staring at the ceiling, apparently seeming very calm. Luckily, it seems that I’ve found like-minded souls in those people who take up bicycle touring. From most accounts that I’ve read, more than a rough outline of a trip is unnecessary. This is mostly due to the fact that once the rubber hits the road, things change. You meet people, or get sick, or find someplace else you’d like to go. My two-part planning strategy of first agonizing and then adjusting seems perfectly suited to this arrangement. I leave for France on September 10th, just under a month from now. As of now, the route that I’ve decided on for my French tour could fit on a bar napkin. It’s basically a U. I will start in Paris and head to Normandy. From there, I want to travel south, and then follow the coast of the country. This is based on a couple of pieces of advice. One friend of mine, a native Parisian, mentioned that the middle of France is nothing compared to the coasts. In my ridiculously biased opinion, this is largely true of the United States as well. The good stuff is all stacked on the sides. I didn’t know how logical this route would be, but then I saw that these guys had done it. Sometimes just reaffirming that something isn’t insane is enough to move forward. I plan to avoid French cities. With enough money and time, I would love to spend time in each city along the route. I love cities. If I ever live in France, it will likely be in a city. But I just don’t have the money to do them justice. Instead, I might roll through but I’ll likely avoid them. There are enough other things to see along the way. Again, totally no idea what I’m doing. 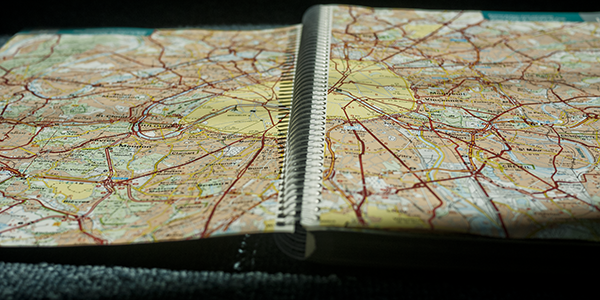 One thing that my open-ended planning strategy makes difficult is carrying a map. I bought a 1:200,000 French road atlas from Michelin. It has scenic routes and back roads and the stamp of approval of other bicycle tourists. It also weighs about 80 pounds. I could tear out only the pages that correspond to my route, but I don’t know my route. I could also buy individual maps that correspond to my route, but I don’t know my route. A third option would be to photocopy only the pages that I need along my route. But, well, you get the idea. I’ll likely tear out the pages that correspond to areas that I’ll least likely explore. More on that problem when I solve it.